As you know I have two boys. When I scrapbook or design a project I usually use their photos. 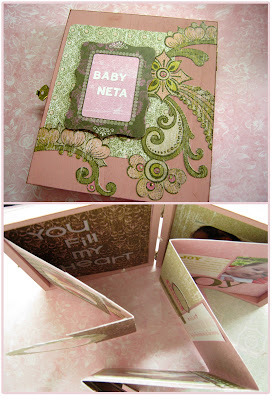 This time I had so much fun making a project for a baby girl. This is a present I made for my best friend's daughter soon after she was born. This is a double accordion mini album in a box. My friend doesn't like a lot of embellishments, so the design is simple and clean. When you open the box the accordions open to opposite sides. It was really great doing this project because I had a chance to use some girly materials and colors. מקסים, אני מאד אוהבת את שילוב הצבעים. Oh, Einat! This is just gorgeous! I've been looking without posting lately! Just wanted to let you know I'm still enjoying your work! כרגיל... מוצלח מאד! יפה מאד! "את" מאד. Beautiful project and beautiful baby!